in Buddism, the darkness retreats are traditionally called “dark retreats” . 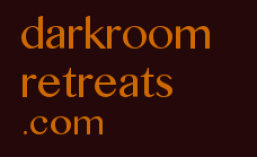 the dark retreats have a long tradition and each facility will have its own particular slant on qualifying to use the facility. most will require that the applicant is a practitioner of budhism and some will require that you are under a teacher, or that you are willing to do so, and/or that you have reached a particular ‘level’ of practice, as attensted to by your teacher. He later received specialised teachings from Tulku Urgyen who supervised Lama Yeshe’s 49 day Bardo retreat of total solitude and darkness in Nepal. In 1997 Lama Yeshe was able to complete a second 49 day Bardo retreat on Holy Island in a specially built retreat-master’s cabin. In a Dark Retreat, the practitioner is sealed inside the cabin for the duration of the retreat. Chamma Ling will provide an attendant to bring food according to the needs of the practitioner twice each day, including one hot meal. Dietary needs are to be described in writing at least two weeks before the retreat begins, and we support both vegetarian and non-vegetarian menus. Supplies can also be purchased and delivered as in Level 2. Costs for food and other supplies are in addition to the cabin rental and will vary according to your needs.